Promised myself I would share my favourite gear of the year as we approach the end of 2014. And what a year it's been! UK lure fishing has gone from strength to strength. LRF seemed to explode. Feels almost commonplace in some areas now. We gained a lure fishing series that saw our techniques and tackle tested. And more mainstream tackle manufacturers tried to get in on the act. So what did I like and why? LURE ROD - I recently reviewed my Major Craft Turel and almost every aspect of my successes this year, featured that rod. However, it's not the Turel that I'm going to list here. I was entirely happy with the Turel until Dan decided to leave a rod in the back of my car, late this year - the Sakura Ten Fighters Finesse Player. I already knew it was a tool. I already knew it wasn't entirely user friendly - in the same way a supercar isn't driver friendly. But temptation got the better of me and before long I was sneaking it out for my Perch fishing. The blank is incredible. Tubular and tight - especially so for a 7g. For the first couple of hours I thought every Perch I hooked was a Pike. I really had to slow myself down on the bites. But more insight is never a bad thing, even if you have to dial it down in your head. First big statement: the Finesse Player is the most accurate casting rod I've ever used (including other top end rods). I believe it's a combination of the Silicon Carbide KR guides and a sublime blank that just seems to load predictably and perfectly every time. I can't explain it better than I look somewhere and the lure just goes there (mostly!). Certainly, it's the most accurate I've cast since playing Sega Bass Fishing down the amusement arcade. Also, might only sound like a small thing, but I'm addicted to the Fuji skeleton reel seat. To the point I already feel like I'm going to struggle to go back to anything else (I hope not - that will get expensive). The increased sensitivity and ease of applying your index finger to the rod blank is amazing. If we're talking small percentage gains, this is a substantial one. I think I lasted three weeks from handing it back, to convincing myself that £300 was acceptable for another fishing rod (it never is). Especially as I've done so well with a £99 rod this year. Last straw was the omission from the 2015 Sakura catalogue - meaning it's been discontinued (it was always limited edition). So I grabbed one of the last remaining rods from France and I've been having a whale of a time ever since. JIGHEADS - I don't think this will surprise anyone. And I don't think I'm giving anything new away that I hadn't heavily hinted at already. Without doubt, the Ecogear Shirasu Fine jighead has been THE successful jighead, in competition, this year. It has brutal hooking power, bends out of snags and back again. Holds delicate lures nicely and has a great stability in fall. Absolutely slays. 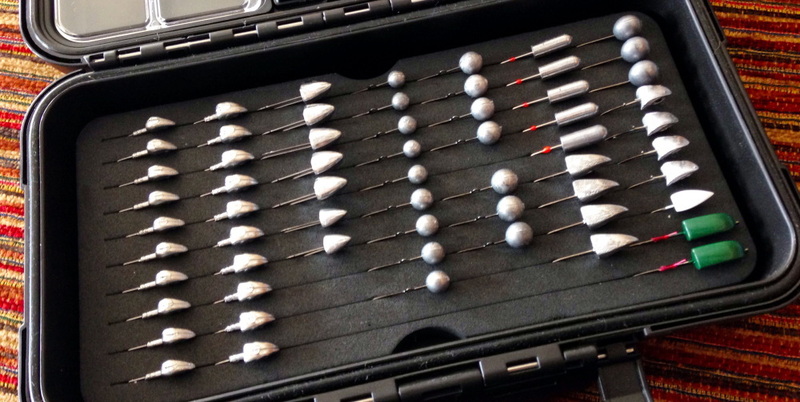 ACCESSORY 1 - People have asked whether it is worth the effort going to the European tackle shows, like Nantes. This is a great example of why the answer is, yes. I spotted the Daiwa ISO telescopic landing net handle at Nantes, back in February. It was the first of its kind that I'd seen that wasn't an import and consequently the price was acceptable at £50 to £70, depending on length. Regrettably it wasn't available from the show, but I stalked the European mail order stores until one became available. They quickly sold out. The ISO will not win any prizes for lightweight design, but this is a tool for a specific job. There have been many times when I've not fished great looking marks because there was no way of safely landing or releasing my catch. The ISO net handle effectively increases your catches because it fixes this problem. How often does a tackle purchase truly do that? Yes, you could take a drop net (faff) or use one of the longer freshwater net handles (not designed for the job) but the ISO is the correct tool for the job. It sits happily on your back until required. You swivel it around under your non-rod arm, release the rubber bung and let the net head slide down up to 6 metres below you. Without doubt one of the best tackle purchases I have made in years. It had paid for itself within 6 months, allowing me to land a 55cm Bass from a high breakwater on UL tackle and securing a first place in the visiting bass angler category, at the Cornish Lure Festival. I would have lost that fish if it wasn't for the ISO net handle. ACCESSORY 2 - Slit Foam. I'm not going to recommend any specific boxes here, although I've been loving models from both Meiho and Spro this year. However, slit foam boxes have been a bit of a revelation for me. I admit, it was love at first sight when I first laid my eyes on a prostaff box in one of the Japanese lure magazines. Whether OCD was the driving force, or possibly just because they look cool as, I wanted one! But once I'd secured the Spro box I realised the real value the slit foam gave me. I have a real problem with seeing the wood from the trees in my tackle bag. Having my jigheads laid out by size and type has really helped me make quick and timely decisions during competitions and my own fishing time. Expensive Japanese hook points are individually protected and there's no fiddling around with dainty little packets with cold fingers any more. My tip for next year. Everyone will want slit foam! LURE OF THE YEAR - This one is easy. I'm concerned people will tone down this recommendation due to my affiliation with the brand, but my lure of the year is the Ecogear Bug Ant. Interestingly however, the reason this magical lure is front of mind for me isn't due to my own success with it. It's down to the success seen by two other anglers. First occasion that stands out was back in May. I had the good fortune to become acquainted with Masaaki Fukuoka. Masa was staying in the UK while he studied English before returning back to Japan. It was a pleasure being around Masa. He's a lure junkie of the highest order. A super talented one at that. I felt quite a bit of pressure finding fish for him with limited time and locations available to both of us. But one particular day stands out where we went on an adventure down to Kimmeridge, kipping in the truck and getting onto the rocks for first light. Everyone who has fished it knows what an epic looking place it is, and for an overseas visitor like Masa it was a day to remember. The icing on the cake was Masa landing the biggest fish of the day on a 2-inch Bug Ant - a proper Wrasse and the piscatorial memento I was desperate to facilitate for Mas. One of the best days of 2014. Then the Bug Ant turned up in another unforgettable days fishing. This time in June. I've really enjoyed working with Sea Angler this year. It does add an extra level of pressure and stress to your fishing when an editor and a photographer have traveled to come fish with you. But when it pays off, it pays off large. Of course, the day I'm talking about was when Dan and I did the light lure Smoothhound feature. And what was the lure that Dan caught that first, unforgettable fish on? Yep, the 2-inch Bug Ant. When you consider how many quality Perch I've had on it too, I hope you can see why I feel there is something special about this lure, affiliation or not. Unforgettable year. Unforgettable lure. LIFETIME ACHIEVEMENT AWARD - By no means a new product. 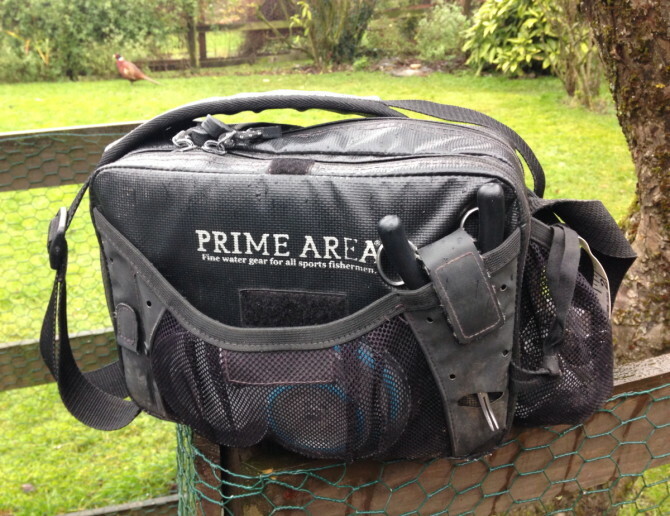 I acquired my Prime Area shoulder bag right back at the start of my LRF adventure. Back in the days where you would go into The Art of Fishing and Ben had got a few samples in from Japan to see what they were like. You had to be lucky. When they were gone, they were gone. It may have been my first visit to AoF in St Merryn and although I didn't intend to spend way too much on a dedicated lure bag, it is without doubt one of the best up-sells I've ever succumbed to. I have subjected this poor little bag to untold, barnacle covered carnage. Not to mention the compulsory obesity of an obscene lure collection where the number of 'must-haves' is unhealthy. I had to check back through my photos to see when it first appeared on my shoulder. I can't be certain when I purchased it, but it was certainly in service by early 2011. It's still going strong today. Should I eventually manage to kill it, I will scour the world for another. Like a right arm to me.